Celebrate our country’s master folk and traditional artists at the National Endowment for the Arts’ National Heritage Fellowships Concert. 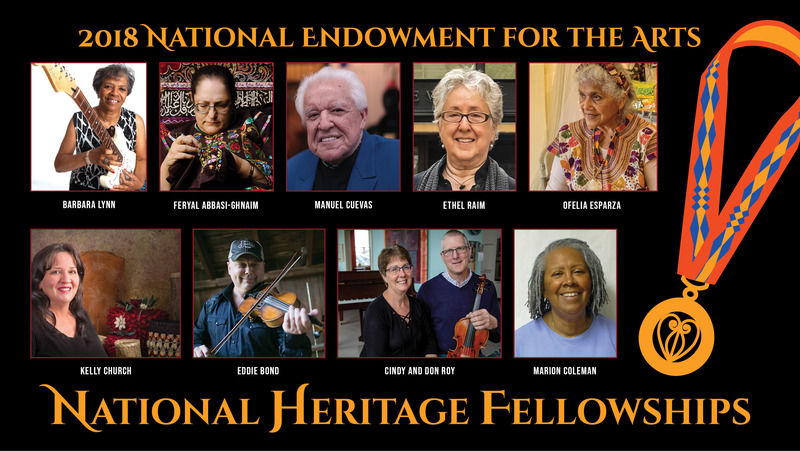 The 2018 NEA National Heritage Fellows are recipients of our nation’s highest honor in the folk and traditional arts. They will share their art and their stories in this evening of performances, demonstrations, and conversations. Hosted by Martha Gonzalez of the Grammy Award-winning band Quetzal. More information: www.arts.gov/honors/heritage. Reservations are filled and have closed. The stand-by line opens at 7:00pm and any tickets available will be distributed on a first-come, first-served basis 15 minutes before show time. PLEASE NOTE: Ticket-holders should arrive by 7:45 p.m. At that time, all unclaimed tickets will be released to those in the stand-by line.